Other than the Synapsida there were three clades of reptiles that had only a lateral temporal fenestra (ltf). 1. Lanthanosuchus and its descendants up to Paliguana had one (thereafter the upper temporal fenestra was also present). Some, such as Macroleter, had only a tiny remnant of an ltf. Others, beginning with Nyctiphruretus lost the jugal-quadratojugal connection so the fenestra became more of an embayment that continued into the lepidosauriformes. 2. Heleosaurus and its descendants up to Spinoaequalis had an ltf (thereafter an upper temporal fenestra was also added). The heleosaurid clade was an offshoot of the Synapsida. Their common ancestor, Paleothyris, likely had an ltf too. 3. The new millerettid/bolosaurid/caseid clade also had an ltf that sometimes resealed itself. This clade included Casea, Cotylorhynchus and the eothyrids, all of which were formerly considered basal synapsids. Figure 1. Australothyris smithi reconstructed. Australothyris smithi (Modesto, Scott and Reisz 2009) Middle Permian, is a new addition to clade number 3. Originally considered a sister to Milleretta and Lanthanosuchus, Australothyris was derived from a sister to Oedaleops and phylogenetically preceded the RC70 specimen of Milleretta in the large study. It had a wider parietal and a wider palate with a greatly reduced interpterygoid vacuity than its sisters. 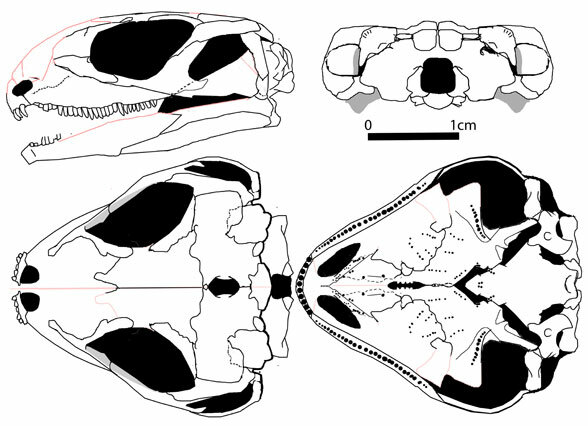 The quadratojugal was much larger, likely due to the greater width of the skull of this tiny herbivore. Australothyris was an important link between the eothyrids and the milleretids. It demonstrates the fact that basal millerettids originally had a substantial lateral temporal fenestra that later was resealed in known specimens of Milleretta. This entry was posted in basal reptile, Millerettids and tagged Millerettidae, permian, Triassic by davidpeters1954. Bookmark the permalink.